Note: The album also features Pliades (the traditional choir from Ipiros), DAEMONIA NYMPHE and DIRTY GRANNY TALES. Whoa! It has already been three years since "Theogonia" was released, huh? 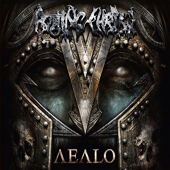 The Greek Black Metal legion toured and straight after that isolated itself in the studio for one year to craft this lethal weapon entitled simple "Aealo", which is the transcription of an ancient Greek word into the Latin alphabet. It means thrashing, catastrophe or destruction, three words that in my humble opinion perfectly describe the band’s brand new album (in a good way of course)! From brutal and raw music, to melodic Black Metal and even Goth influences, ROTTING CHRIST lately embraced their country’s tradition and started using musical and lyrical themes from their culture. Thus, from the mythological concept of "Theogonia" we reach "Aealo" with its traditional Greek music elements originating mostly from Ipiros, central western Greece. The album kicks in with "Aealo", where Pliades are accompanied by Themis’ blasts. I think I already said enough and I guess such an album can’t be described in words. You have to listen to it many times to understand its hidden beauties and get lost into its world. Thumbs up for the amazing artwork, too, that fits like a glove to the musical & lyrical concept of the album. Once again, these guys make us proud, the true ambassadors of Greek Metal!